This week we were counting down the minutes for our much-loved Italian friends of over 30 years to touch ground in Dubai. We deeply share so much, but our passion for FOOD shines. A common problem with house guests in Dubai, where there is so much to do and see, is that so little time is left to prepare for dinner. Since we invite family and friends to share time and experiences, never feel that you need to impress them with complicated or complex menus. Instead, I always advocate for simple and easy cooking which brings out the flavours of the star ingredients. If you choose your menu smartly and simply, you will start to enjoy having company. Last night, our Italian feast was simple, gastronomic and yet easy to prepare. The menu consisted of antipasti of grilled fennel, asparagus and baby leeks and featured Italy’s famous simple grilled peppers and, not to be forgotten, the addictive burrata; everything was drizzled with a Palestinian extra virgin olive oil which derives from the best olives on earth and surrounded by cherry tomatoes sliced in halves. For the primo piatto, our friend Luca and his son Andrea made their famous Porcini mushroom risotto with saffron – a tradition whenever and where ever we meet! For the mains, or i secondi as they are known in Italy, we had Melanzane alla Parmigiana, which I previously prepared and froze. Cooking is about choosing good quality ingredients, fresh, easy recipes and allowing a lot of time to spend with friends and loved ones. Simple IS good; spending time with loved ones is a treasure. * Wash and pat dry the peppers. * Place on the barbeque turning every 4 minutes until it is charred all over, alternatively grill on the gas stove using a diffuser turning every 5 minutes until charred all over. * In both methods transfer the peppers to a plate and cover with a clean kitchen towel until they have cooled down. * Peel and discard seeds then slice longways. * Place in a bowl and slice the garlic thinly and add it along with the chopped parsley, olive oil, salt and vinegar to the peppers and mix. * The peppers can keep in the fridge for up to 1 week. 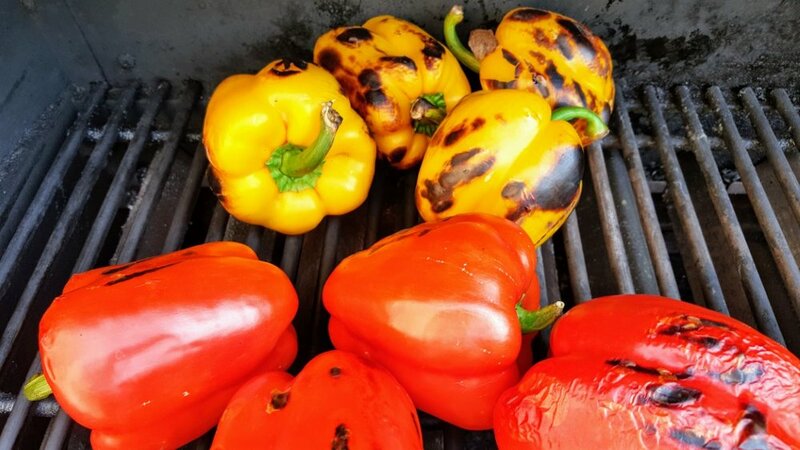 * Grilled peppers can keep up to 6 months in the freezer so very handy for last minute recipes. * Use it in sandwiches, pastas and goat cheese. Per Serving: 85 Calories; 6g Fat (56.1% calories from fat); 1g Protein; 9g Carbohydrate; 3g Dietary Fibre; 0mg Cholesterol; 9mg Sodium.